As one of the most reviewed sewing machines on Amazon, the Singer 4423 heavy duty sewing machine is right in between it’s smaller brother, 4411 and the big brother 4432 so what makes the 4423 model special? 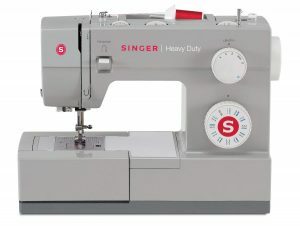 As another sub $200 sewing machine, this model has plenty of features to get your sewing projects done without a hitch and the signature quality of Singer machine will make you wonder why was this sewing machine so cheap. Like rest of 44’s series, you will have a sewing machine that boasts a sort of old-school look with a gray hard-plastic shell. Performance is a big plus for this machine as the improved electric motor will have enough power for your sewing to feel smooth and steady. With 4423, you will be able to sew materials like Leather, faux leather, denim, vinyl. Not only this sewing machine can sew these delicate and high-end materials, but in the end, produce a professional looking product with even and consistent stitches. Just remember, materials like leather are unforgiving because once you make a hole, it stays there forever, so use the correct needle (always change the factory needle) to not ruin the material. Refer to our Complete Leather Sewing Guide for more information. Like other singer sewing machines (thing singer 4432 or 4411), this sewing machine comes with a hard-plastic casing in which you will find a high-quality metal interior which ensures that the sewing machine will stand the test of time, no problem. Plus the weight will be enough to keep the machine stable on the table, but light enough to carry around. Note that carrying case is NOT included with the basic model although you can purchase a more expensive bundle with a bunch of extras like needles, carry case and repair tools for a little bit of extra money. 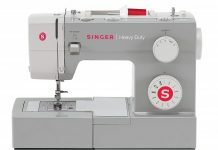 If you’ve read other singer reviews, you’ll know that most of the Singer sewing machines come with stainless steel bedplate which makes the feeding of fabric smooth, easy and steady for best results. One of our favorite things with these sewing machines is that the drop-in bobbin has a transparent window so you can see how much thread is left and plan your swing accordingly AND the bobbin itself is very easy to take in and out. Not many sewing machines have this cool feature and I wonder why. Whenever I see that a sewing machine has an automatic needle threading, I cheer. 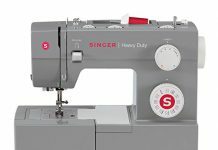 The Singer Heavy Duty 4423, like 4432 comes with an automatic needle threading feature which makes the start-up process quick and easy, especially if you’re a beginner, or have a problem with vision. This model comes with one of the most important features and that is control over the length and width of a stitch. With a simple and handy dial control, you can cycle through multiple options and customize the stitch settings to your material requirements and to your liking. And, most importantly, a 1-step buttonhole which makes making button holes a breeze. With this amount of customization options, your basic home sewing needs should be covered. The only thing we dislike about this sewing machine is the foot pedal. It is just too sensitive! if you haven’t gotten used to it and press it, the sewing machine will speed up like a Lambo with the pedal down. Even worse, you can’t adjust the sensitivity like you can with other sewing machines. Is the Singer Heavy Duty 4423 worth your Money And Time? At a sub $200 price point, and often times under $100, we think that this sewing machine is a great deal for the money. You will be geting a mid-range sewing machine that feels high-end, produces a product that feels high-end which in result makes you feel like a high-end sewist. This sewing machine is beginner friendly so if you’re just getting into the craft of sewing, this will be a perfect entry point. The included manual will get you sorted and you will be up and running ( or up and sewing) in no time! Check out the Amazon reviews if you want to see more in–depth reviews from other people who have bought this sewing machine.